Formula 370 Super Sport: Plush cruiser pampers passengers. We've sung the praises of Formula designer John Adams' ability to create fine hulls, but little did we know about his talent for interior design. From the curved lounges finished in rich UltraLeather to the cabinets done in fine cherry wood in the cabin of the Formula 370 Super Sport, it's clear Adams knows what the boating public wants. His designs are what you might find in high-end custom homes, and they work just as well in the 370 Super Sport's interior. "He really knows what's up and coming and what he picks out is going to make most people very satisfied," said Scott Smith, marketing manager for Formula Boats. Adams' designs are the complete package—excellent interiors with some of the best hulls in the business. 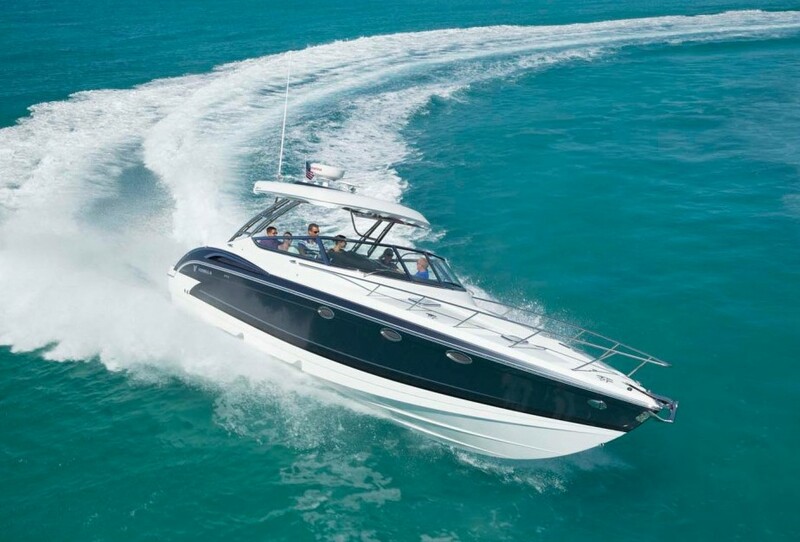 It used to be with performance cruisers that you had to sacrifice speed and handling for the abundance of amenities that come with the beamier boats. 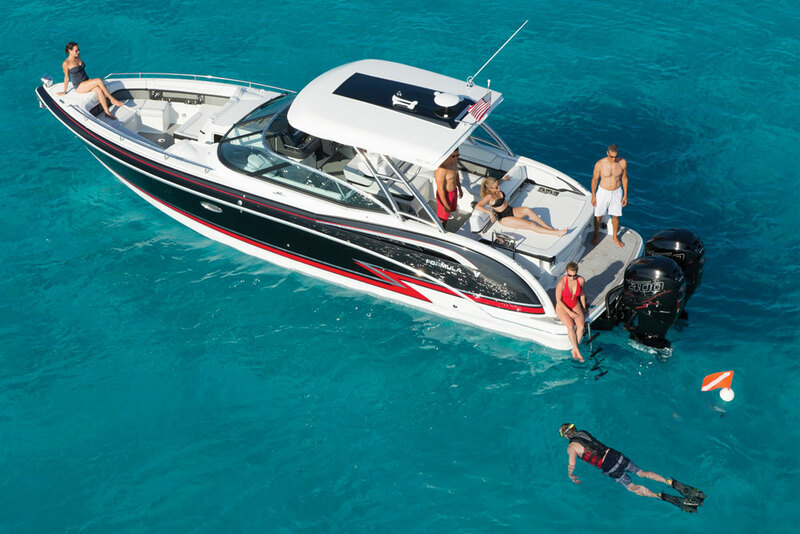 That's not necessarily the case with the 370 Super Sport, which could hold its own against the smaller sport boats. 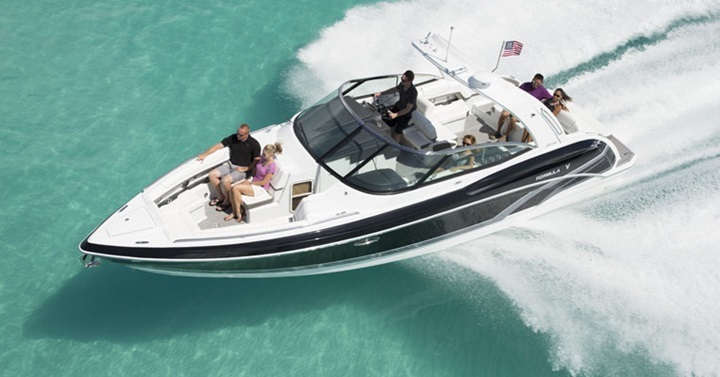 Formula brought to our Performance Trials in Fort Myers, Fla., a Super Sport equipped with a pair of 425-hp MerCruiser 496 Mag HO engines. At first glance it doesn't seem like a lot of power for a boat weighing nearly 7 tons, but the engine package was a strong performer in the 37-footer. 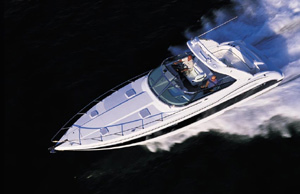 On a 94-degree day, the boat reached 58 mph at 5,100 rpm on GPS. 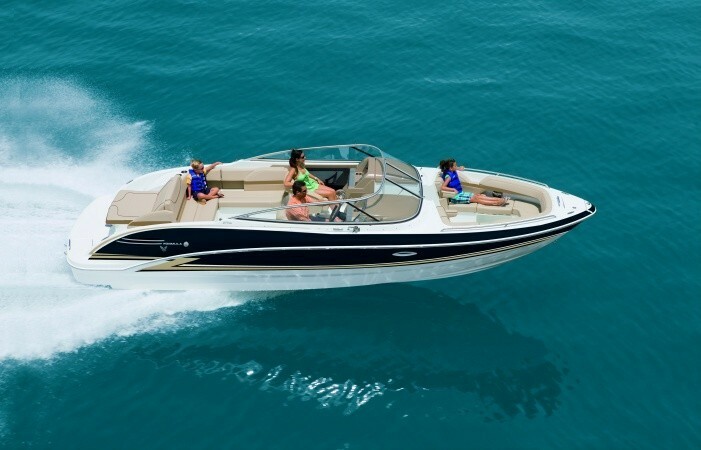 Our lead test driver thought the boat with Mercury Bravo Threes may have been a little underpropped and with the right set could have topped 60 mph. Formula likely picked props that were best for overall performance and not just for top speed. It was still a comfortable ride up to top speed as the boat mashed its way across the 1-foot wind chop in the Gulf of Mexico. The Super Sport reached plane with the Bennett tabs dragging in 6 seconds with plenty of visibility for the driver and passengers. 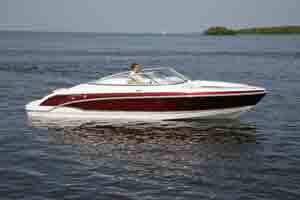 In acceleration tests, the cruiser had ample snap, reaching 22 mph in five seconds and 48 mph within 20 seconds. Midrange acceleration took 12 seconds to go from 30 to 50 mph. 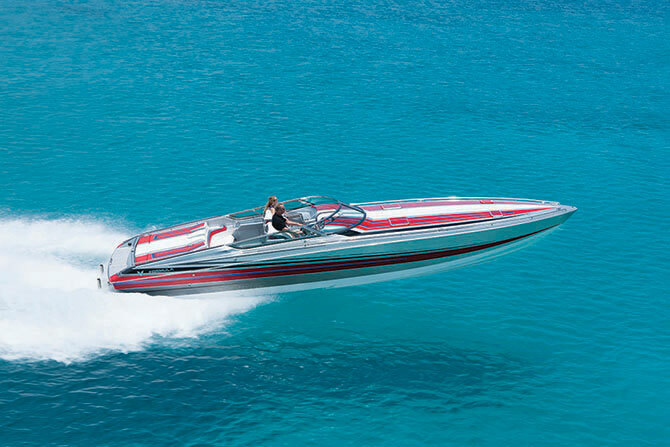 The strong suit of this boat was handling during slalom drills and turns at cruise speeds. Never once did the boat hop or skip, and with full-hydraulic steering it made handling a breeze. "It has manners like a smaller boat but it's like driving a condo around," said our lead test driver. "It's very comfortable to drive, smooth and predictable." The mold work on the long and tall hullsides was among the best at the Performance Trials—typical of the superior work that comes out of the Formula plant in Decatur, Ind. The paint job was expertly handled in black Imron with a silver accent stripe. Protecting the boat was a large plastic rubrail with a stainless molding insert. Each of the screw heads was perfectly aligned and there were no gaps between the hull and rubrail, even in the complex area around the swim platform. Under the hatch, which lifted the rear bench on an electric screw jack, the MerCruiser engines were attached to Mercury mounts. A special mounting system situated the motors over the stringers, allowing good access for routine maintenance. All wiring was supported with stainless adels, just what we want to see on a boat that retails for nearly $330,000. In the cabin, the strong workmanship continued, from the carpet installation to the headliner. There were no gaps in the headliner or carpet, and the direct lighting helped bring an elegant feel to the cabin. Up on deck, Formula anticipated the needs of its owners. Various sections of the deck were done in nonskid, providing a sense of security for deckhands trying to access the windlass on the bow. A stainless-steel rail lined the deck and had solid support. Access to the carpeted cockpit from the transom was through a hinged door on the port side. Just in front of the fiberglass door was a galley with a freshwater sink and Corian countertops. Under the galley, Formula included an ice chest and a refrigerator. To starboard, a U-shape bench—with the table set up—allowed six or seven people to enjoy a meal on the water. A two-up helm seat was just ahead of the dinning area, protected by a wraparound polished-stainless windshield. All the gauges were set in custom bezels in burlwood panels, creating a sharp-looking dash. Among the notable items: a chart plotter, compass and a remote for the Sirius-equipped stereo system. Belowdeck, which featured an aft cabin with a small porthole to provide ambient light, all of the cabinets were done in cherry wood. The galley to port had a Corian countertop with a sink and single-burner stove built into the top. Just above was a microwave. To port, a large head included a small sink and shower—plenty of room to get ready for an evening on shore. Just in front of the head was a small entertainment center, which included a 13" television and just below was another refrigerator. The plush V-shape couch could be converted to another berth or would be perfect to hang out while enjoying the air conditioning. Four Bomar hatches and three portholes on each side allowed for plenty of ambient light. Formula designer John Adams tries to keep pace with the design industry and monitor the latest trends—and in the case of the Formula 370 Super Sport, he was right on the money. Propeller Mercury Bravo Three 15 1/4" x 26" and 14" x 26"
Upgrade to Kohler gas generator ($9,440), polished stainless windshield ($5,245), Corsa Captain's Call exhaust ($3,940), electric windlass with stainless anchor ($3,920), Flagship black Imron graphic ($3,365), cockpit enclosure ($2,275), remote-control halogen spotlight ($2,140), Raymarine 320 Raychart ($1,690), AM/FM and multidisc CD changer ($1,545), VHF radio and antenna ($1,055), vacuum discharge head with macerator ($925), freshwater engine flush ($570) and central vacuum system ($480).